We also make sugar free chocolates which are low calorie sweetener for health conscious people. 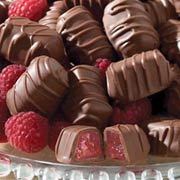 These chocolates are gaining popularity among the chocolate lovers who love chocolates but are calorie conscious. The business avenues of the chocolate boutique comprises of manufacturing, supplying and exporting of chocolates, fruits, cereals and nuts. Customers from across the globe can source these products at best of industry prices.